For over 200 years Tennessee whiskey and Kentucky bourbon has been produced essentially the same way, with pride, passion and tradition. It's the White Oak charred barrels used to age that delicious bourbon whiskey that's one stage here. The insides of Oak barrels are toasted and charred to caramelize the wood's natural sugars. Once filled, the bourbon whiskey matures in the barrels for years; each barrel will hold about 53 gallons and weighs over 500 pounds. The barrel wood expands and contracts as the seasons change, allowing the bourbon whiskey to seep into the charred oak staves, developing its amber color, plus, most of its taste and aroma. A barrel is only used once; the company then sells them to collectors, craftsmen and other spirits makers to store rum, tequila, scotch, Irish whiskey and other liquors. Crafted from a gorgeous chunk of a Jack Daniel's® American Oak bourbon barrel stave, the Oak barrel wood looks amazing and come with a certificate of authenticity. 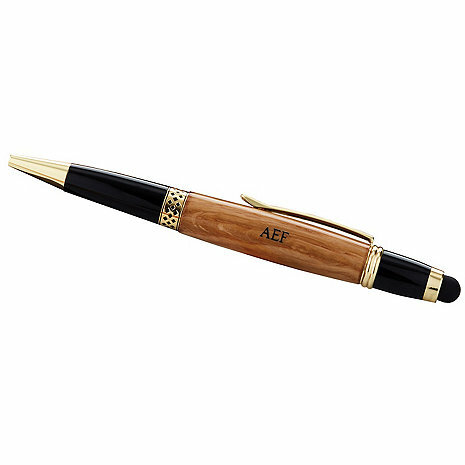 Featuring an extremely smooth twist mechanism, Parker™ style ballpoint refill and gold plated accents and clip; you can easily take notes, draw or simply turn a page on your device with this gorgeous stylus writing pen. The durable rubber tip protects the device's surface from scratches and smudges and allows you to type precisely and comfortably. It works on all capacitive touch screen devices. Not only will your stylus pen be a one of a kind keepsake, it's perfect for your brother, father, boyfriend or husband- it's guaranteed to knock his socks off!